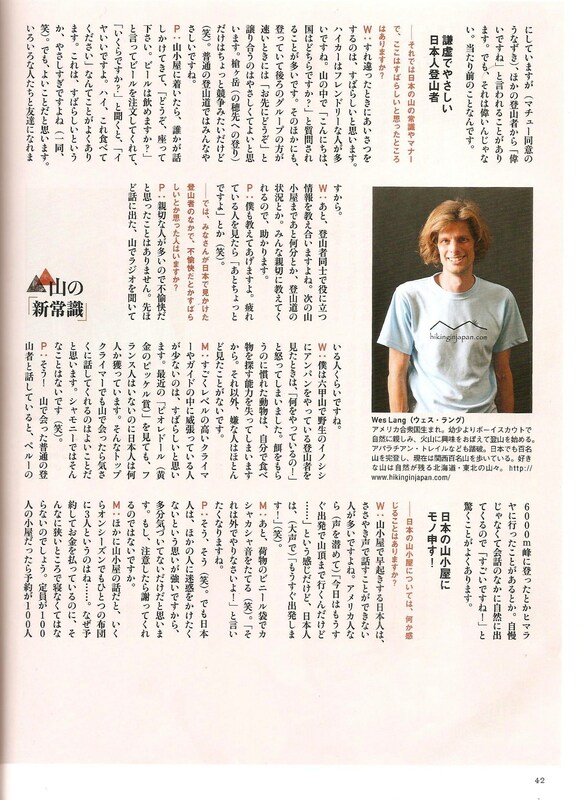 On July 23rd, 2012, I was invited by Yama-to-Keikoku to participate in a discussion about hiking etiquette in Japan’s mountains. Joining me in the meeting was Canadian nature photographer Peter Skov and Matthieu Lienart, a French licensed mountain guide living in Japan. Before the meeting, the editors sent us a list of questions to be discussed, including what surprised or disgusted us about Japanese hikers, some differences in etiquette between Japan and our home countries, as well as any anecdotes to support our opinions. Peter and I met up a few hours before the meeting to compare answers and talk about life in the mountains. It was good to finally put a face to someone you’ve gotten to know through the on-line world. It felt as if I were reunited with a long-lost friend, a testament to the influence and power one’s words can instill. We both shared similar interactions with Japanese hikers, and decided to go into the meeting with a balanced view of both the positive and negative mannerisms. It took some time to locate Yama-to-keikoku’s office, which was hidden down a narrow backstreet. As we made our way to the meeting hall, we couldn’t help but notice how the temporary nature of the makeshift office. 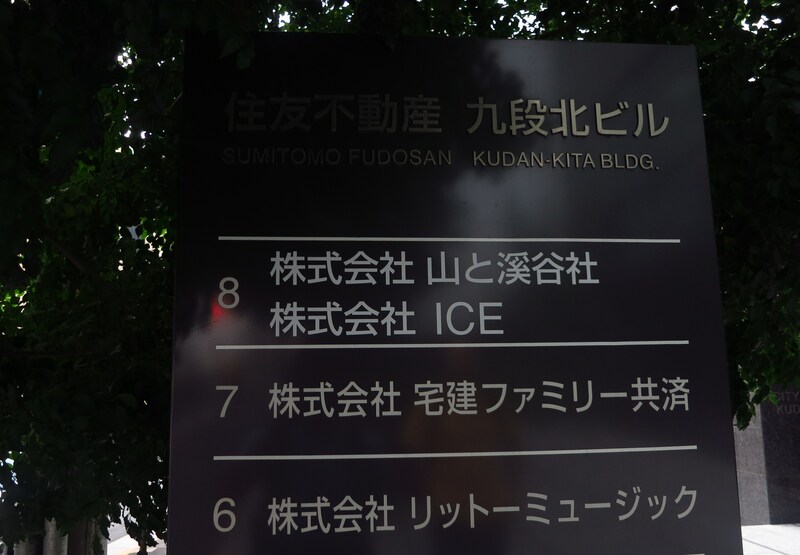 It was later revealed that the company recently moved to this new location, after the Tohoku earthquake caused structural damage to their original headquarters. The discussion, conducted entirely in Japanese, was led by freelance writer Naoki Ohzeki, whose attention to detail was meticulous. The main editor, Kamiya-san, sat behind and scribbled notes while listening to our stories. He was also in charge of refilling our cups of Japanese tea, a task that left me with quite a caffeine buzz. Rounding out the meeting was a professional photographer, who snapped away flawlessly during the duration of the two-hour meeting. 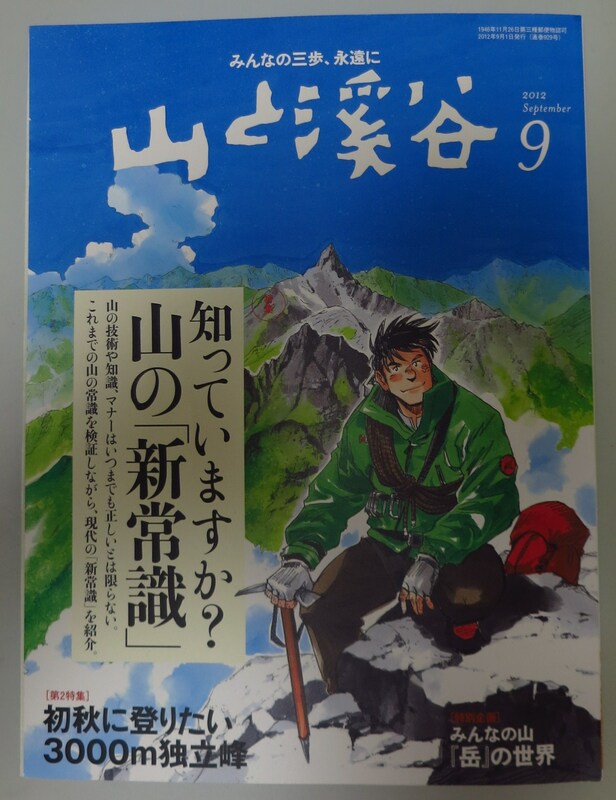 The results of the encounter can be found in the September edition of Yama-to-Keikoku magazine, which is on sale at any major bookstore throughout Japan. A summary of our conclusions can be found below. First up was the issue of early risers. We talked about the penchant for waking up at ungodly hours to watch the sunrise. Matthieu commented on the fact that the sun rises much earlier here than in Europe, while I added that a lot of hikers in the west tend to watch the sunrise from the comfort of their own tent before retreating back into dreamland. 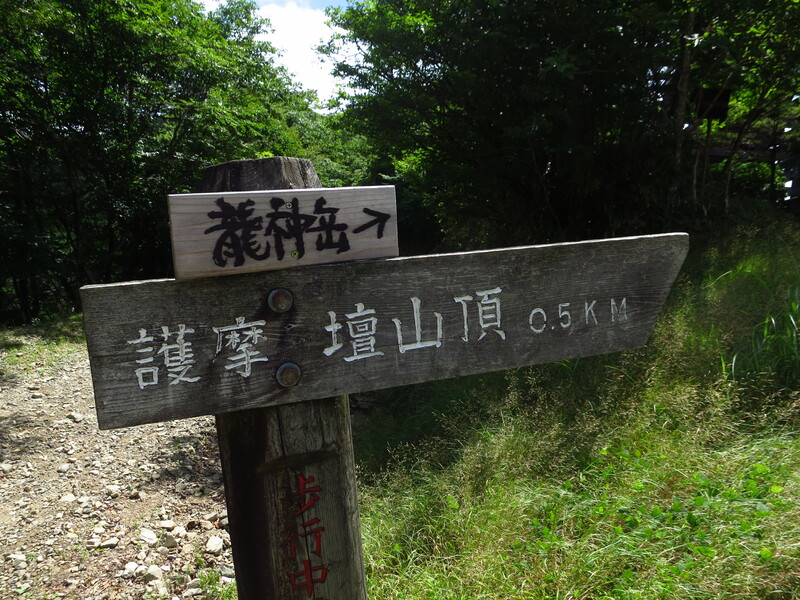 Japanese hikers, on the whole, tend to stick tightly to predetermined schedules, regardless of the weather or hiking conditions. Since most Japanese people do not get a lot of vacation time, they like to cram in as much as they can in a limited amount of time. 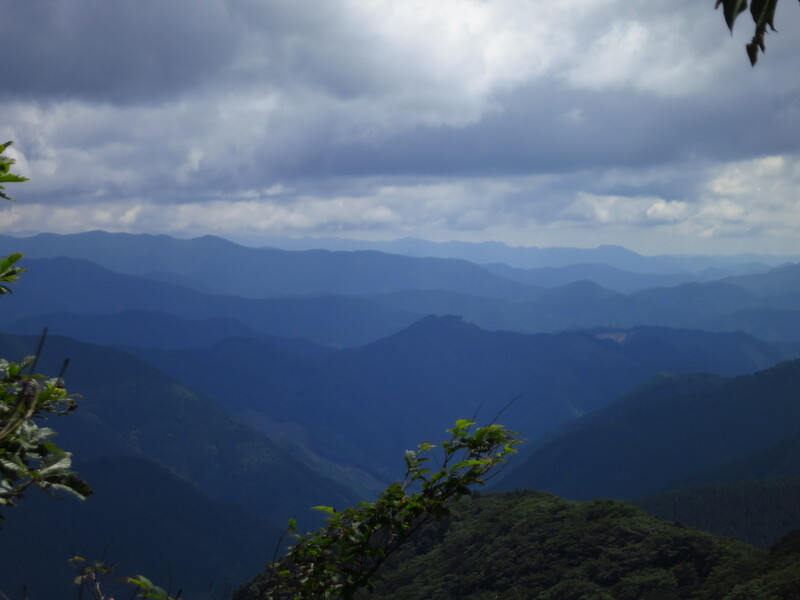 I brought up the story about my traverse in Daisetsuzan, where heavy rain pounded on my tent all night. The rain finally let up around 9am. When I unzipped my tent, the entire campground was deserted, sans one other tent. The previous day there had been over 30 tents, and everyone broke down camp in the pouring rain instead of adjusting their departure schedule. Speaking of schedules, both Matthieu and Peter commented on the tendency for a lot of hikers here to climb in all weather conditions instead of cancelling their trips or waiting out the weather. The two recent accidents at Mt. 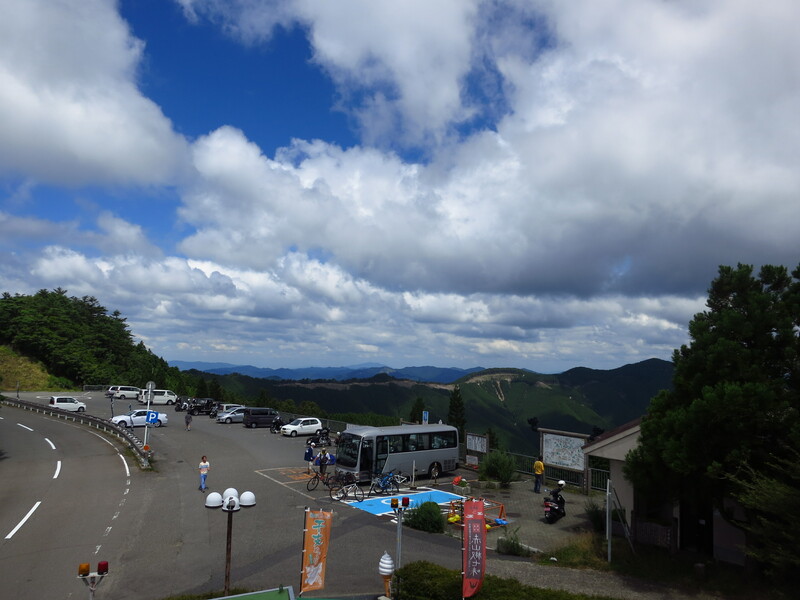 Shirouma (in May of this year) and Mt. Tomuraushi in Hokkaido (a few summers ago) were brought up as an example of how simple common sense and the foresight to turn back when things became too difficult could have saved lives. Next, the topic moved to the custom in Europe for hikers to casually veer off the trail, whereas in Canada and Japan that would be considered taboo. Matthieu explained that this was probably due to the long and rich history that Europeans have had with their mountains. They have lived in the mountains for centuries and have lived off the land, so it’s only natural that people would roam through the alpine pastures instead of following well-groomed trails. 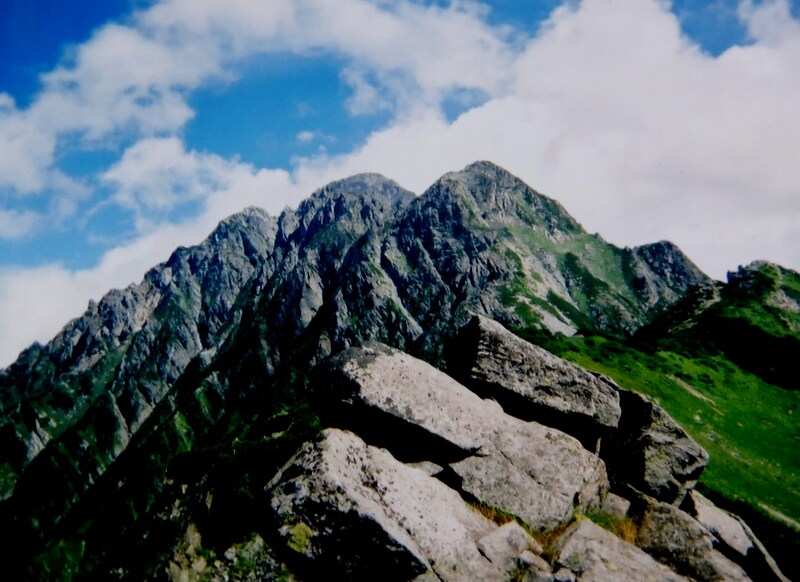 In Japan, however, the mountains belonged to the Gods, and only practicing mountain priests initially set foot there. Then, I took the discussion into much dirtier matters by elaborating on the poop problems plaguing a lot of peaks here. Much of it has to do with overuse, but some of the problems boil down to plain and simple manners. In the U.S., hikers are expected to bury their excrement at least 200 feet from a water source, but in Japan I’ve come across numerous instances where people have relieved themselves just off the main trail, and have left the toilet paper there to prove it. In the States hikers are encouraged to carry out their used toilet paper, and some mountains such as Mt. Shasta in California require trekkers to pack out their poop as well. In addition, garbage is also a problem in Japan’s forests, and I addressed the fact that few if any Japanese hikers pick up litter on the trails. My hiking friends are often surprised when they see me picking up candy wrappers or discarded bottles. Luckily, the conversation moved onto the positive aspects of Japanese hikers, and I courageously volunteered to go first. To be honest, it was hard for me to come up with any positives at first, but luckily my pre-talk planning paid off, as I focused on the friendly nature of hikers here, who generally offer warm greetings when passing you by and will often ask where you are from. Also, large groups regularly pull off to the side of the trail to let you pass, regardless of whether you’re climbing or on the descent (unless you’re scaling Mt. Yari of course). Hikers will often teach you about trail conditions or distances as well. Peter added that once you arrive at mountain huts, complete strangers will often ask you to sit and put a cold beer in front of you, free of charge. From here, the interview bounced back to focusing on the negatives, this time by addressing any unpleasant things we’ve seen hikers do. Peter couldn’t think of anything other than perhaps people using radios while they walk. I told the story of seeing a guy feeding bread to a wild boar on Mt. Rokko, right in front of my eyes in broad daylight without thinking it strange. Mountain huts were the next on the list, and I starting the proceedings by addressing noise issues. Hikers tend to make a lot of noise when they wake up and seem unable to whisper. Instead, they talk in their normal voice regardless of who may be sleeping. Perhaps they feel that everyone should wake up early when they are in the mountains. Matthieu added the noise caused by hikers rummaging through plastic bags deep in their packs, which could just as easily be done outside of the hut, away from the late risers. Peter reminded us that most hikers aren’t intentionally trying to cause a nuisance and they they are probably not aware of their noise levels. Additionally, Matthieu talked about how, during the busy summer season, mountain huts won’t turn anyone away, so you’ll have to fit 3 people on one tiny futon space. I guess the issue would be with those that have made a reservation in advance vs. those that have turned up unannounced. In Japan, both paying customers are treated the same, but in Europe, the ones that turn up late have to sleep on the floor near the entrance. Likewise, mountain huts are incredibly expensive, so I prefer to stay in emergency huts. Of course, on Mt. Iide you have to pay 2000 yen for the emergency huts, even though there’s no food or water. This is more that what I paid to stay at the hot spring at the foot of the mountain! 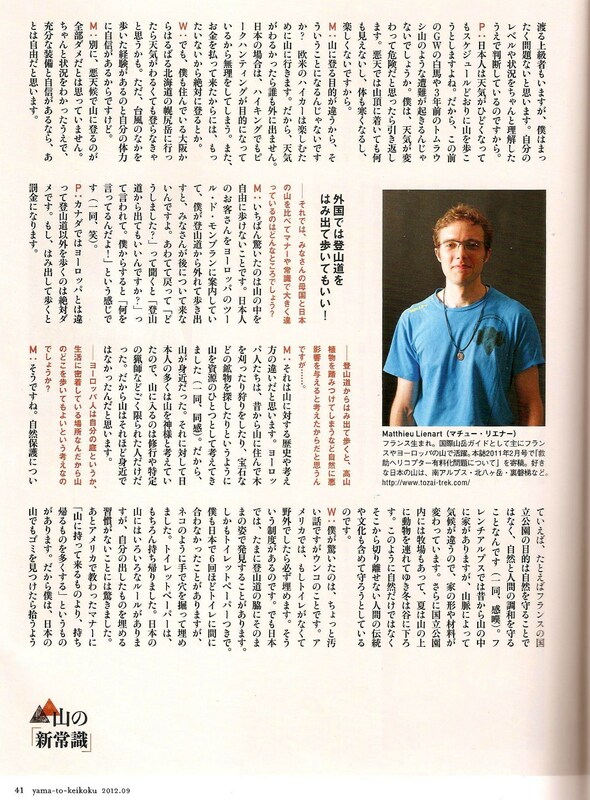 Finally, the article ended with differences between national parks in Japan and parks in our own countries. In the U.S. and Canada, there strict rules about camping, as well as day use fees for many parks. In Japan, many parks are privately owned and don’t charge admission fees. Rangers at national parks in the States often require you to register your hiking intentions and they will sometimes check your gear to make sure you’re properly equipped. Many places also require a wilderness permit to enter. Matthieu doesn’t like these kinds of places, and feels the ultimately responsibility for being adequate equipped rests with each individual hiker. If someone is caught in bad weather without the proper gear, then they have to face the consequences. This incredible spell of immaculate weather is likely to end soon, so I need to take advantage of it somehow. The problem is, temperatures hover in the mid to upper 30s, and with the humidity higher than most of my students grades, the only option is to head to higher ground. The previous day, a Friday, dawned clear and warm, but peculiar rainmarks dotted the forecast. Deciding to take the ‘wait and see’ approach, the clouds rolled in on cue around 11am, and Osaka was presented a bewildering thunderstorm just before the lunchtime crowds hit the neighboring cafes. Today, however, the same clear skies showed themselves at dawn, and the umbrella marks were thankfully left off the menu. 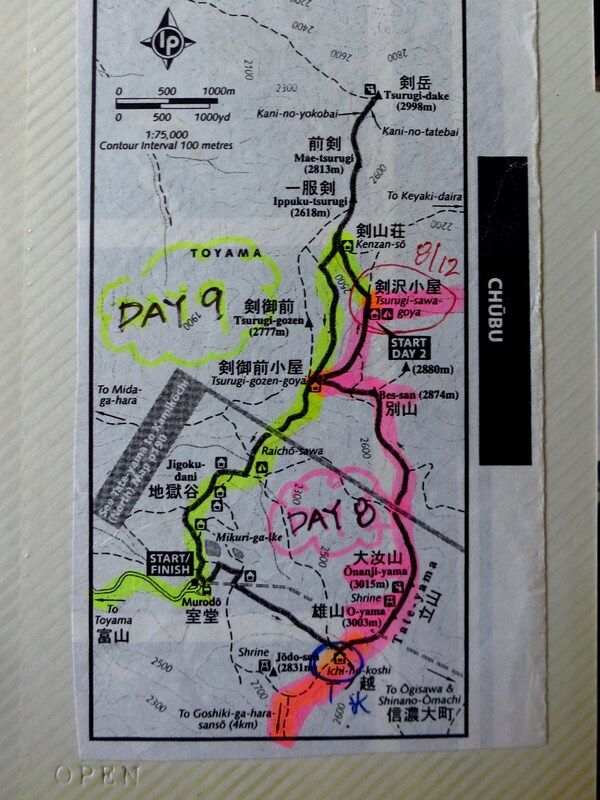 My original plan of hitting Odai-ga-hara fell by the wayside when I missed the 7:15am train. As I flipped through the guidebook, I noticed a peak on my 300 mountains list nestled deep in the mountains of Wakayama Prefecture. 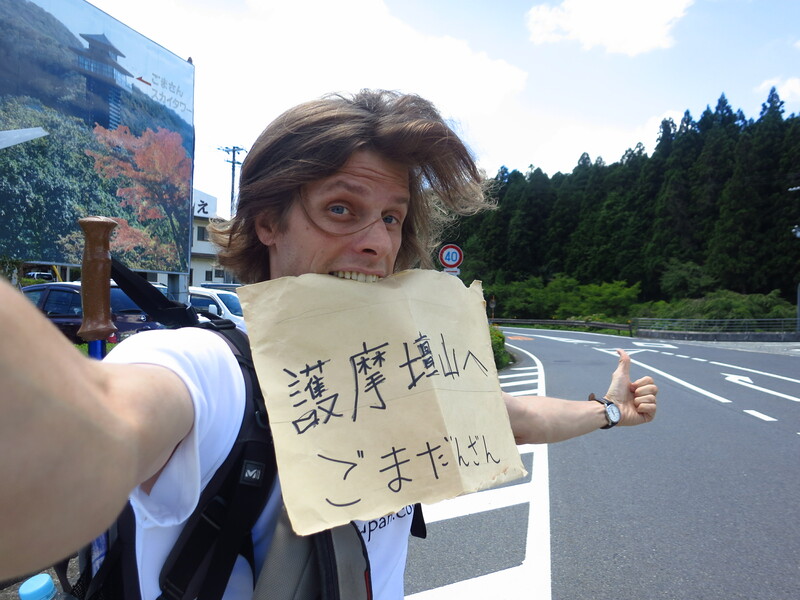 The train departed at 9am, so I grabbed my gear and embarked on another journey into Kii Peninsula’s rugged terrain. After taking the Nankai Koya line, and being herded into the sardine can otherwise known as the Koyasan Cable Car, I ran in front of the crowds in order to be seated at the front of the bus bound for Okunoin. “You must really know the system”, commented the elderly woman sitting next to me. We were the first to disembark the train and had prime seating for the cable car journey. This also put us as some of the first passengers on the now overflowing bus. I’ve learned over the years to always make an effort to be the first one off the train, especially when hitting crowded trails or transferring to buses for popular destinations. Once disembarked, I trotted off to the intersection where the Koya-Ryujin Skyline began. According to the signposts, I had a 30-km hitch to reach my destination. This time around, I had the hindsight to make a signboard in advance. Would it help my cause? The most important thing when hitching a ride is patience. Remember that it only takes one ride to get to your destination. Giving up or looking desperate will not help your cause. It was 11 o-clock sharp, the skies were as blue as as Diana Ross’s album of the same name, and I still had plenty of daylight left. The second car that passed by stopped, nearly wiping out a cyclist as it pulled over to the wayside. His name was Takumi, and he was giving his elderly parents a lift from the hospital to his hometown of Ryujin-mura. My driver dropped me off at the michi-no-eki, which houses a small souvenir shop, a restaurant, and a tourist trap of a tower called the Gomadanzan Sky Tower. I immediately went to the second floor restaurant and ordered an overpriced lunch set. I’d need sustenance on this journey, and this was my only option. After lunch, I bypassed a tempting visit to the tower in lieu of hitting the hills. I’m sure Mt. Gomadanzan must have been one spectacular mountain in ancient times. 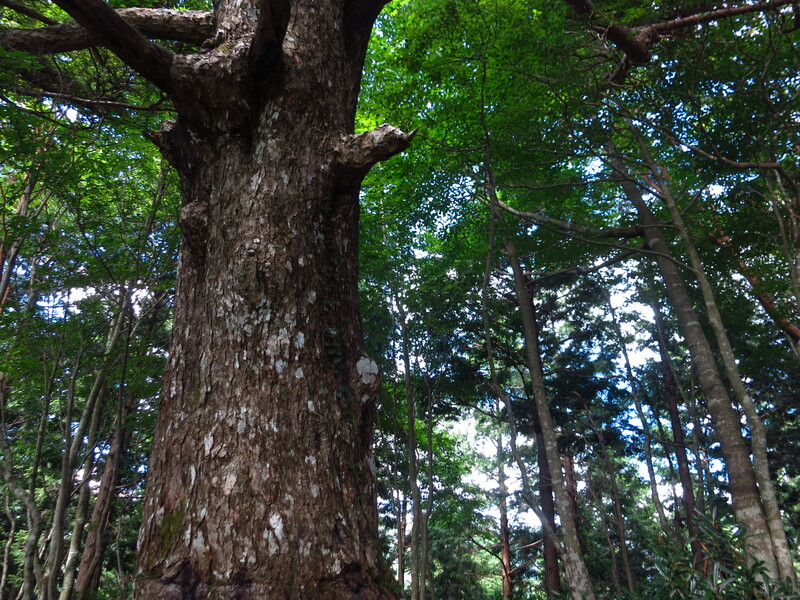 The proximity to Koyasan made it an ideal location for the practice of Esoteric Buddhism, but that all changed when the road was built to connect Koya with Ryujin onsen, one of the most famous hot springs for beautifying the skin. Nowadays the passage is filled with tour buses navigating the treacherous switchbacks, as well as adventurous bikers who often underestimate the hairpin turns and end up plummeting into a deep abyss. The views on the byway are eye-bulging, as the asphalt thoroughfare literally hugs the ridge for most of the journey. This is what put me off about the mountain. From the parking lot it’s only a 10-minute walk to the summit! Despite the proximity, I knew that heading to Wakayama’s highest peak should provide me a bit of a respite from the scorching summer heat and I was not let down. The path immediately ducked under the cover of a deciduous forest canopy, the likes of which I had not seen in some time. How this area was spared the wrath of the cedar planters is beyond me. This is what the path looks like a mere 50 meters from the crowded parking lot. I’ve been told that the peak becomes crammed with onlookers during the autumn season, but on this warm August afternoon I had the entire place to myself. I reached the top of my target destination after a gentle 500 meter stroll. The views opened up a bit to the west, marked by a signboard proclaiming this as one of Wakayama’s 100 best places to watch the sunset. Who comes up with these lists anyway? Bored prefectural employees that spend most of their time driving along these forest roads in hardhats? 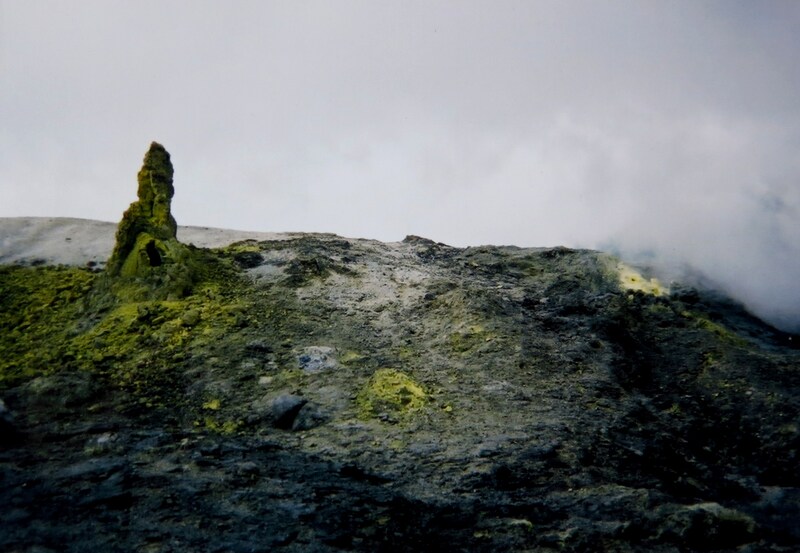 Once on the summit, a side spur continued on the ridge to Mt. 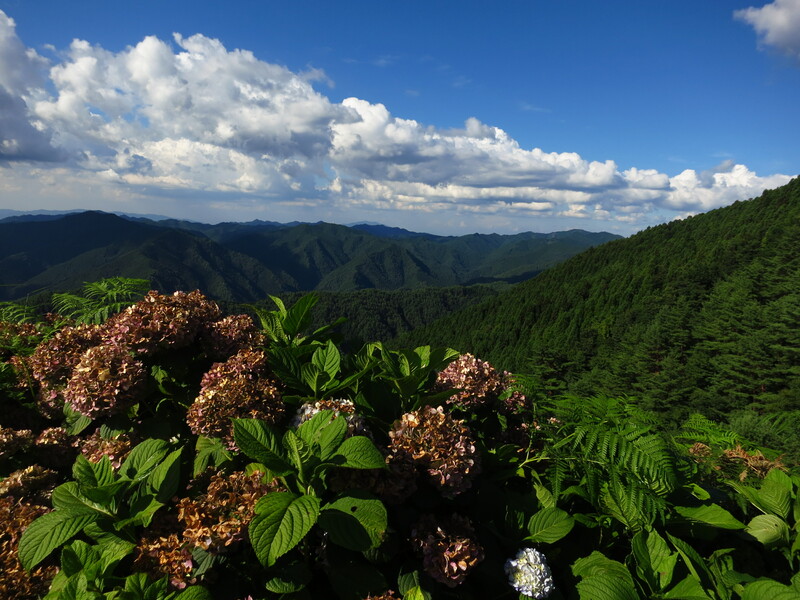 Ryujin, the true high point of Wakayama Prefecture. 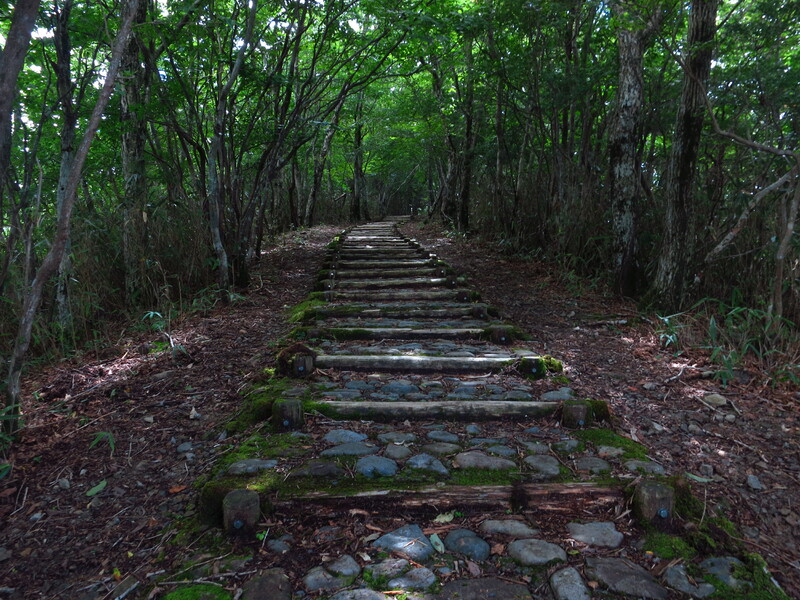 The path was immaculate, as the views started to open up towards the northeast, across the endless fold of mountains of the Kumano Kodo. Somewhere at the end of my sight line lay Hongu shrine and the pristine shoreline of outermost section of the peninsula. NHK! 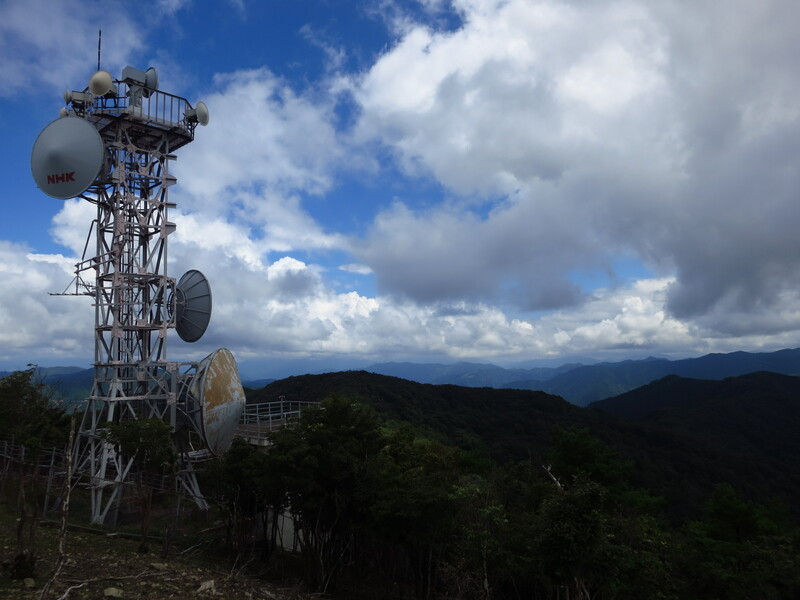 Leave it to Japan’s government-run broadcaster to ruin a great mountain. As I rounded the final bend to the top, not one but 2 behemoth towers awaited me. I had not scene such scarring since my conquering of Okinawa’s highest mountain back in February. I tried to stay positive. At least I wasn’t sharing the mountain with half of Kansai. The easy trail followed alongside a paved forest road that split off from the Skyline. Most of the road was completely hidden except for the last 500 meters, which required walking alongside the deserted and slowly degrading road. At the terminus there was a rest house which served basic refreshments and housed a large picnic area for school groups. From here the path ducks back into the forest, meandering along a 3-km traverse to connect back up to the main road. I rested here for the first time since starting my hike, sitting on the lush grass and enjoying the cool breeze. Long breaks tend to make me sleepy, so I rested only long enough to down a handful of mixed nuts and a half a liter of water. The route passes through a rhododendron park and past a couple of bird-watching platforms before crossed a handful of steep mountain streams. The final 400 meters to the trail’s end was through a cedar forest, my first of the entire day! It was no surprise, as most of the forest roads are built for the sole purpose of logging and plantation planting. 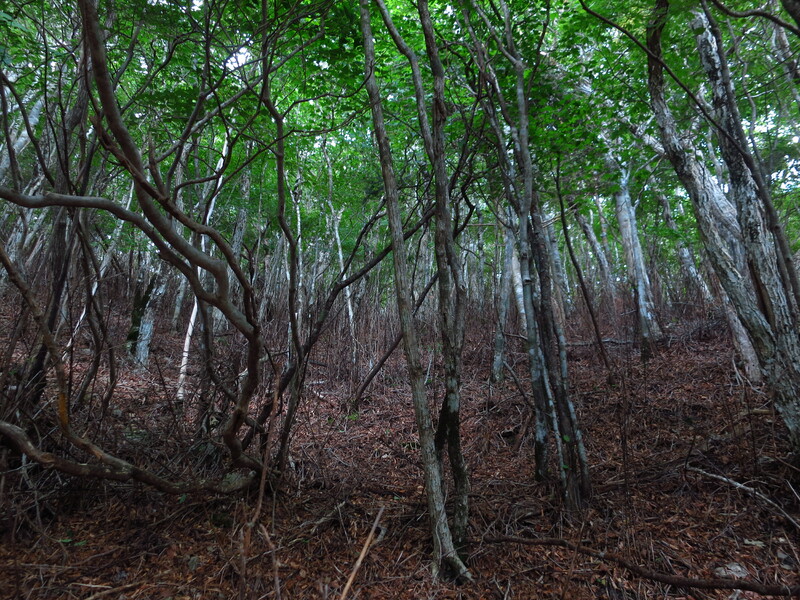 At least the deeper, more secluded areas of the peak retained their unspoilt beauty. 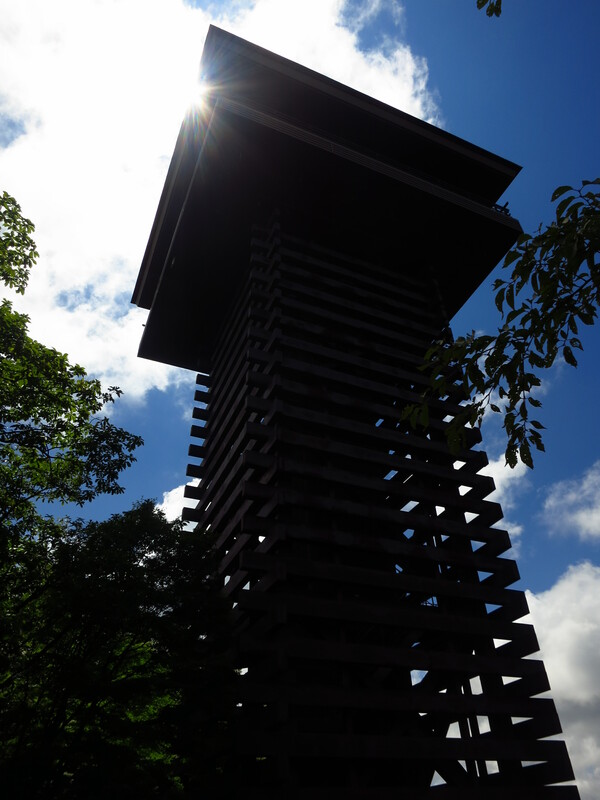 With the hike behind me, I stood at the edge of the Skyline, turning my signboard over so it read “Koyasan“. When I made the sign earlier that morning I knew I would have to hitch back to civilization. The biggest problem, though, was that all of the traffic was heading towards Ryujin hot spring, the opposite direction from Osaka! As I waited for a car to approach, I weighed the options. “Perhaps I should just start walking along the road until someone stops”, I muttered. I knew from my past experience that this almost never works, because you often run into cars who would likely stop but are in the middle of a curve so they can’t safely stop to pick you up. “I’ll give it 3o minutes”, I added, knowing that all it takes is one ride to get me where I needed to go. The first couple of cars that passed by kept on going. They were definitely driven by elderly local who had weary eyes for dirty, blond-haired foreigners. The next car slowed for an instance but continued on their journey. “Perhaps, they’ll turn around after discussing the situation”, I dreamed. Many times this happens, as most Japanese are not able to make snap decisions without discussing them with either their other passengers, or after some deep internal dialog. Time check: 25 minutes. My feet were tired from all of the walking but I stood my ground. The fourth car, a white minivan pulled up and immediately stopped. “Get in”, exclaimed the father from the driver’s seat. They didn’t even have the courtesy to pull over out of the road in case a biker came flying around the corner. I always make a habit of hitching in places that have a broad shoulder or turnout so cars can physically get out of traffic to pick me up. It doesn’t always work. “We’re not going to Koyasan“, explained the driver, “but we can drop you off somewhere in Nara.” All I really needed was a ride to a train station. Any train station would do, but the party of 3 insisted on driving me as far as they were going, which turned out to be Saidaiji, three hours to the north. A father and son returning from a fishing outing, accompanied by the son’s best friend, who was gung-ho about testing out his English. The son, a member of Japan’s Self Defense Force, knew a few phrases from joint drills with America’s finest. Some of the phrases that came out of his mouth were not fit for a child’s ears. We spend the next couple of hours chatting about life in Japan, as I taught some useful vocabulary, which mostly involved words related to the scenery at hand. My adventure was an astounding success. 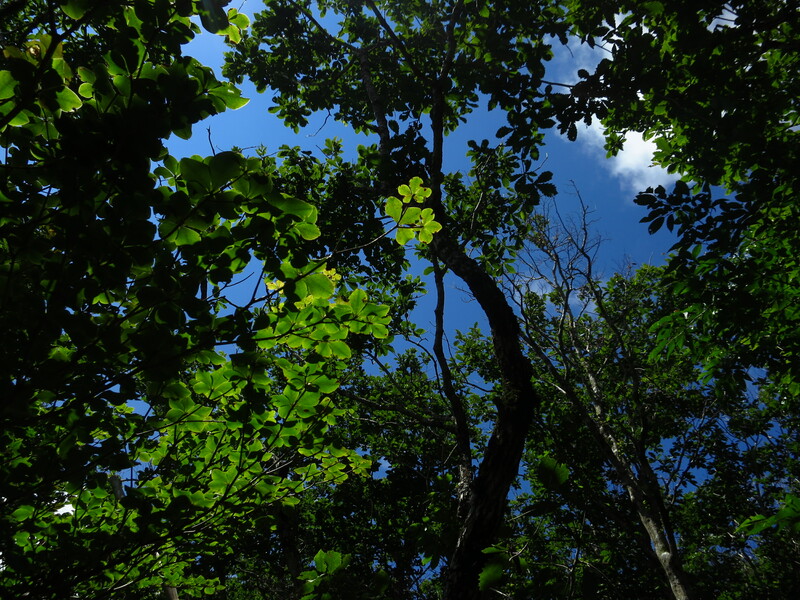 Not only did I knock one more peak off of Japan’s Highest Prefectural Peaks list, but I also got to explore some amazing virgin forest without overheating in the August sun. This rekindled my spirit for more mountain adventures. Would I have a third round with Odai-ga-hara, or are the mountains of northern Kyoto and Shiga calling me?